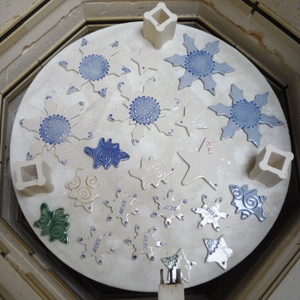 Ever wonder how a piece goes from clay to kiln? Check out our technique tutorials. My muses, inspirations and anything interesting I come across during my daily ramblings. ​Featuring the Celtic Knot Number Tile series. Perfect for house or apartment numbers, these unique stoneware tiles are suitable for use indoors and out. Take a sneak peak into what has been cooking in the studio during the last few months: new high relief tiles, Celtic knot house numbers and much more! A walk-through explaining the direct method of setting and grouting a custom ceramic mosaic tabletop. Before setting and grouting a mosaic, a substrate is needed. Use cement board to create a a base on which to mosaic a custom tabletop. Learn the basics of pressing a ceramic tile using a plaster press mold, a rubber mallet and some good old-fashioned elbow grease. This hand-carved Endless Celtic Knot plaque entwines two lives in an eternal dance. Perfect for a wedding or anniversary. A tutorial with instructions to create a plaster press mold from a model tile using a cottle board mold form. Step by step instructions explaining how to easily make your own inexpensive kiln vent. Learn how to replace a failed element and contaminated element holder. ​The hand-carved Celtic Knot Oak Tree plaque entwines branches and roots in an endless dance. 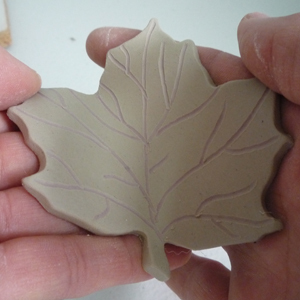 Create colorful ceramic leaf ornaments to celebrate the changing hues of Autumn. A clay carving technique to create intricate designs for tiles, featuring a Celtic Knot alphabet tile set. A simple way to build a drying rack for greenware using PVC pipe. Ah, the slab: a flat sheet of clay, usually rolled to a uniform thickness, plain and boring. But this unexciting slab holds so much potential! Create beautiful personalized snowflake ornaments for the winter season. Experiments with the beautiful and meticulous sgraffito carving technique. 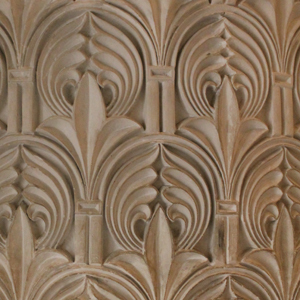 ​How to create a tile press mold by carving a design directly into the plaster of the mold. Unfortunately, I have to face the fact that it is now fall. With glorious sunny days and temperatures in the 80s this past week, I can almost pretend August lingers still and chill and frost are far distant. I didn’t – quit my job, that is. Sorry to ruin the suspense, but as of this posting I am still employed (albeit part-time).